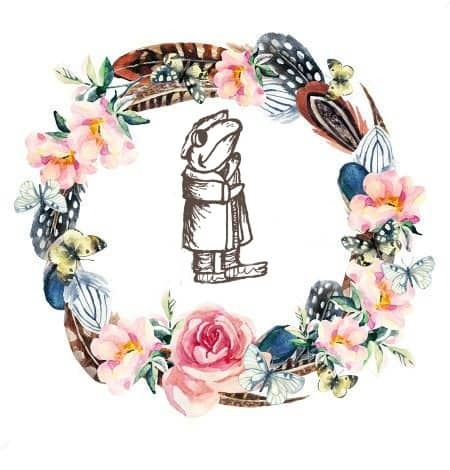 Here we are for the fourth installment of the Toad Hollow Book Club. This month, we’re reading The Night Circus by Erin Morgenstern. I know that some of you have read it already — might I suggest listening to the audio book read by Jim Dale? Helen and I have read the book MULTIPLE times (best book ever!!!!) and we both got a new appreciation for it when listening to it. 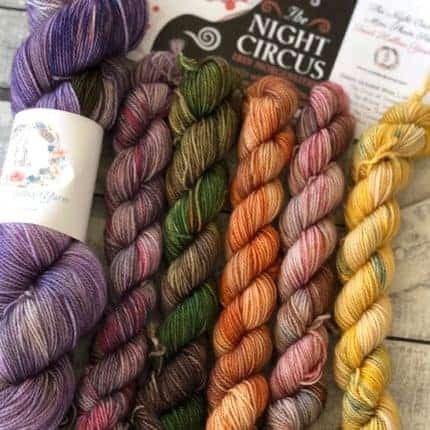 This month we are joining up with Jake and Rae from Dogstar Knits Makecast to bring you not one, not two, but three (that’s right, THREE) different takes on Night Circus yarns. Jake’s yarn, Le Cirque Des Reves — which is awesome! — is available only on his site. For our contribution, we have Tsukiko’s Cloak (dyed by me, Mary Beth) which is 100 grams of pure gorgeousness (on our Sock Toad base — a 80/20 Superwash Merino/nylon mix with 400 yards). 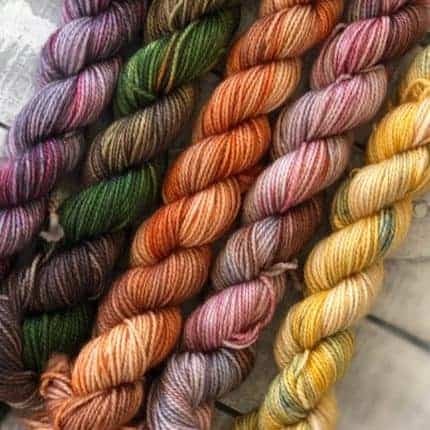 Then Helen just lost her mind and dyed five mini skeins because, basically, she just couldn’t make up her mind which of the colors she wanted to choose. They are all based on parts of the book: Chandresh’s Gift is a lovely orange for the kittens he gives the twins; The Wishing Tree is greens and browns and bits of yellow for the wishes; The Carousel is grey with orange, brown and black based on the animals described on, you guessed it, the Carousel; Circus of Dreams is a mixture of red, black and white for the cover of the book and the circus overall; and Open What Is Closed, which is golden yellow and green, is from an impression she got from reading about Widget’s tent of scents (if none of this makes sense to you, it will after you read the book). Each of the minis are 20 grams/92 yards for a total of 100 grams/460 yards. 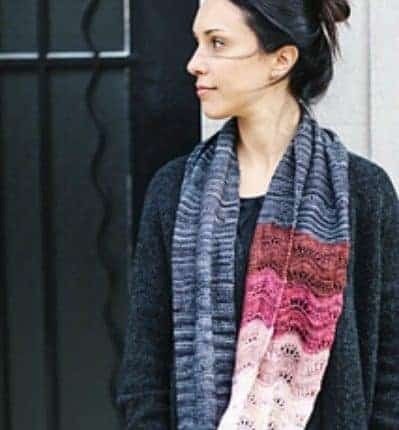 Patterns: We wanted a pattern that used mini skeins and having just fallen in love with the Gradient Band Cowl from Joji Locatelli while we were at Yarnings in PA, we decided that’s the one! 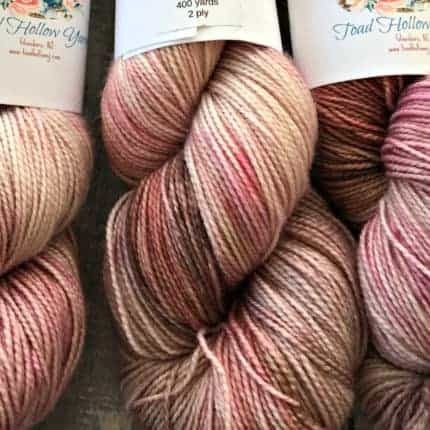 The pattern calls for 650 yards of the main color and 44 yards of the minis. We are altering it just a bit so you don’t have to buy two full skeins and a set of minis. You will have a little less of the main color and a bit more of the minis. It’s going to be spectacular — trust me! And we are offering the super secret extras again this club. The Toads are hitting the road again. This weekend, July 28, we will be at Wool Works in Putnam, CT for a trunk show. 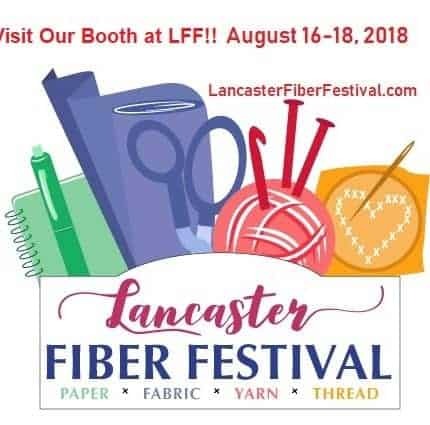 Then, when we get back from that, we have to hit the ground running because the Lancaster Fiber Festival is just over two weeks away (OMG — so much to do)! We have just upgraded our booth size to a 10′ x 10′ because our original 5′ x 10′ space will not hold all the yarn and bags we are bringing. If you are a local maker and are free that weekend, there are still spaces available and it’s a fiber festival in August that is INSIDE with AIR CONDITIONING!! Come see us and say HI! we are in booth 323. 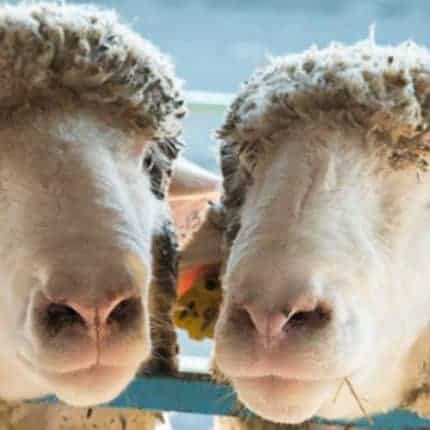 After Lancaster, it’s full steam ahead for our favorite event of the year, the NJ Sheep and Wool Festival, September 8 and 9. Hello! We are Helen and Mary Beth, sisters from NJ, and also known as The Crafty Toads. We hand dye beautiful yarn and make project bags. Our inspiration comes form all over: favorite books, our beautiful Jersey Shore surroundings and other fun, whimsical ideas. Come check out our Youtube podcast, The Crafty Toads, to see what new craft or yarn has grabbed our attention (we have the crafting attention span of an ant). 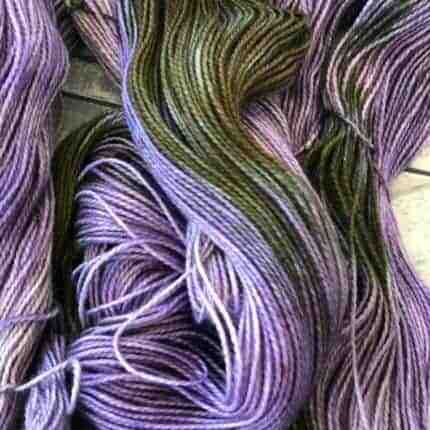 For the last several weeks, the Toads have been dyeing like crazy to prepare for TNNA. We knew we would have quite a bit left to update the shop when we returned but we wanted to have a good representation of all our colorways. TNNA was a blast. We met so many great people and took some orders to expand our wholesale reach as well as set up some trunk shows at new to us shops. Stay tuned for more info on those. When we got back from TNNA we took a couple of days to enjoy visiting family (NEPHEWS!!!) and then a couple more to regroup and recharge — because 4- and 6-year-old nephews are exhausting and GROSS. 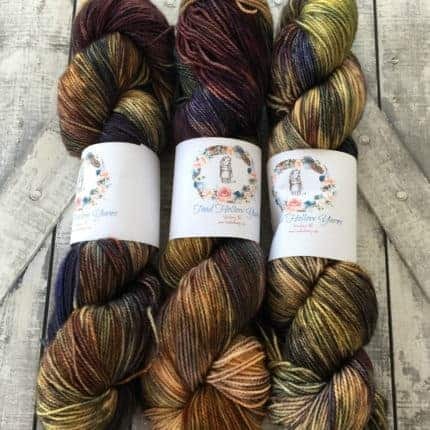 Earlier this week we went on a listing bender and updated our shop with all the Sock Toad, Hairy Toad and Sweater Toad we brought back with us. We also listed the popular Dream Catcher Kits and the sample 50-gram skeins of our TNNA colorway. Just head to the shop to see all the beautiful yarn.